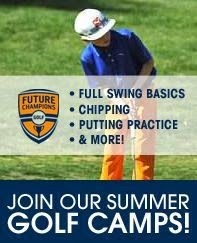 This post is sponsored by Future Champions Golf Summer Camps. You all have heard me talk about D. He is almost 8 and about to go into 3rd grade! Where does time go? Seriously? I feel like just the other day, he was a 4 month old who refused to sleep in a crib. D loves playing. All things. Whether it is hide and go seek or basketball, he loves moving. Well, a year ago, he took a golf lesson at his school and loved it. 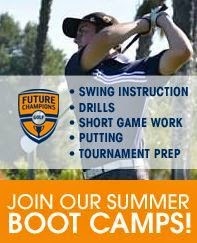 So when I heard about the Future Champions Golf Summer Camp (local to San Diego), I knew it would be perfect for him! There are a few options for you to choose. Basic Game Improve Camp: This camp is geared towards beginner and intermediate golfers who are looking to focus on the three major aspects of golf and improve those aspects over the three days of camp. The first two days will be at Stadium Golf Center and the third day will be located at Sail Ho Golf Course. Pizza lunch will be provided days one and two. A hot dog and chips will be provided for lunch at Sail Ho Golf Course. 3-Day Program is a signature program provided by the Future Champions Golf Academy. Players are divided by age and skill and will learn with their peers in a fun and focused environment. The first two days will be spent at Stadium Golf Center working on full swing basics, chipping and putting practice. Day 3 is a really fun day on the Sail Ho Par 3 Golf Course in Point Loma with the kids playing a 9-Hole Scramble format. All players receive an award at the end of camp. This is probably the one D will do. Student: Teacher Ratio: 8:1 Max plus golf counselors and assistants (regularly have elite high school and college players assisting) For most camps, kids are split into age groups of 6-8, 9-12, and 13 and Up. I am so excited for D to try out this camp! Do you have a son or daughter age 6-13? I can't wait until S is old enough to try it out too! There are many amazing classes for children that can make them learn about the great game of Golf.